Only pay for licensed providers. No charge for front desk and billing staff. No catch. No set-up fee. No contracts. 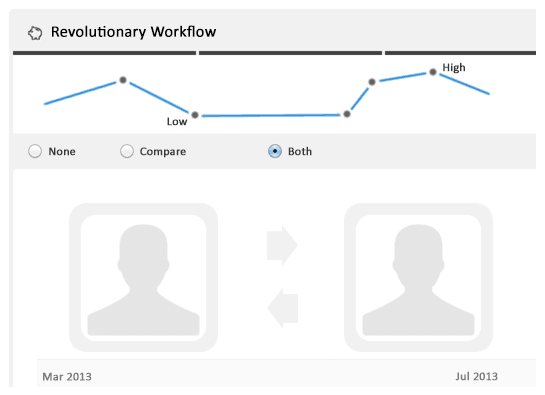 Our customizable templates and actionable metrics slash documentation time and streamline workflow. 1) Customized Notes – We Adapt To You. As a clinician, you are the most important person in your clinic. When you treat, the clinic makes money. When you spend hours doing documentation and don’t complete your notes, cashflow is crippled. The basic unit in In Touch EMR is a person. You shouldn’t have to adapt to us, we adapt to you. With our proprietary custom form builder, you can create your own templates and document patients your own way. We’ll give you templates to begin with, but you can make them your own and change them as much or as little as you like. We are a family of licensed physical therapists with over 10 years of experience in software. We built In Touch EMR with the before,during and after patient experience in mind. We have streamlined patient intake, scheduling, documentation and billing with a simple, but unique workflow called the ‘unified practice workflow’. Schedule a demo with us and learn more. In 10 minutes, we’ll show you how In Touch EMR can save you hundreds, potentially thousands of dollars each month in your practice. The math will make sense. Finish notes, submit claims, get paid. That’s the secret mantra. Just finish your note and we’ll send it automatically to the billing software. Push a couple of buttons and your claim is scrubbed and submitted to the insurance companies, all before your patient leaves the clinic. What if you could create a patient record without having to type in the patient’s name, address and date of birth? It’s possible, and we save you time and reduce denials with this unique technology built into our billing software. 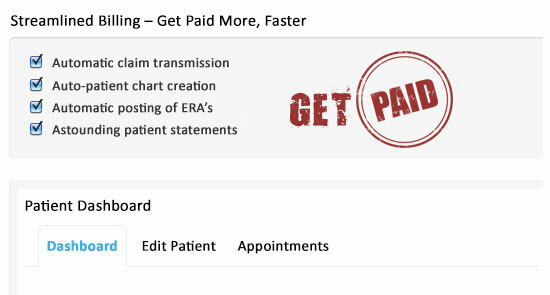 When ERA’s come back from the payor, your biller can post them with one click, saving you hours of manual effort. Patient statements have never been simpler and easier to understand. This gets you paid quickly. 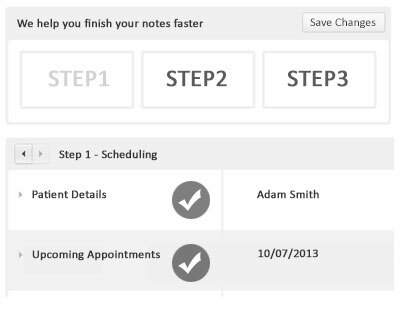 In Touch EMR helps you improve your workflow before, during and aftertreatment. Here are 10 ways we can save you at least 5 minute with each patient visit. When you ‘check in’ a patient, we automatically count it as an authorized visit. When a note is finalized, the claim automatically appears inside the billing software. We help you automatically scrub a claim and determine if there are any problems before its submitted. Access our software from any computer, any tablet with an internet connection. Every time we update the software, you get the benefits at no additional cost. The clinician completes documentation with point and click technology. The biller saves time because claim is pre-filled, scrubbed and can be submitted with one click. ERA’s are posted automatically. Statements are generated and mailed to the patient. Patients automatically get appointment reminders and newsletters. Imagine if this system saves you 5 minutes per patient (most customers say it saves them a lot more). The impact is pretty powerful (exponential, in fact). Fast, simple, easy documentation with our customizable template builder, with Medicare compliance (Functional Limitation G codes, PQRS reporting) built in. Claim is automatically transmitted to the billing software, scrubbed and can be submitted with one click. ERA’s are posted automatically. Reports to track every single aspect of your cashflow. Let us walk you through a demo customized to your practice and if we don’t show you how you can save at least $100 a month, we’ll send you an Amazon gift card for your time.